Sierra Leone is still recovering from the civil war that raged between 1991 and 2002, resulting in tens of thousands of deaths and the displacement of more than 2 million people (about a third of the population). Sierra Leone remains among the least developed countries in the world, ranking 183 out of 186 countries. Life expectancy is 48 years and youth unemployment is at 70%. Rates of child and maternal mortality are high, levels of education are low and, despite rich resource endowments and abundant land, more than 60 percent of Sierra Leoneans live on less than $1.25 a day. In West Africa, many communities depend on agriculture for their food and income. As a result, children commonly drop out of school to help their parents farm the land to make ends meet. While helping in the fields provides some support to the family, a child without an education faces long-term obstacles. For Daniel Mumuni it was different. “I was fortunate to have parents who understood the value of education and ensured that I had the best education despite our meager family resources,” he explains. His personal story has given him the ability to tell others about the transformative effects of education. Growing up in one of the most deprived regions of Ghana, Daniel was still able to achieve a quality education. This has shaped his worldview, including empathy for the most vulnerable. 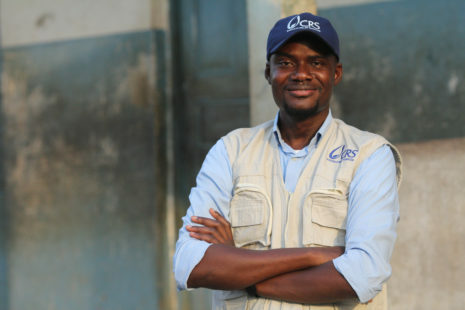 Daniel now lives in Sierra Leone and is proud to be part of Catholic Relief Services (CRS). Growing up, he witnessed the impact CRS programs had on the lives of his neighbors. “CRS was a household name in my village,” he says. Offering meals to children doesn’t just keep them in school, it also encourages parents to become more engaged and committed to improving their children’s education. Daniel has witnessed this firsthand—parents have volunteered to upgrade school facilities by providing and transporting building materials. This is their way to show they believe in the importance of education, and to prove that they have the power to build their own futures. To learn more about the country or to hear personal accounts of CRS’ work in Sierra Leone, check out CRS in Sierre Leone and the CRS Rice Bowl Story of Hope.